Salmon...will we have a salmon season? The PFMC will meet April 5 – 11, 2018 in Portland OR with a final report on the quantities of Chinook salmon in the ocean for the 2018 salmon fishing season. At present, the PFMC has proposed three options for In-River Fall Chinook salmon fishing. This means that an In-River Sports Fishing season is proposed for the Klamath River Basin. This sounds good, but I am afraid that the quotas are going to be small like they were back in the late ‘80s and early ‘90s. There is a problem of what the Fisheries Service calls “over fishing”. In fishermen speak, this means that the Klamath River Fall Chinook salmon did not make their “natural spawning escapement” goals of 40,700 for three straight years. The 2018 ocean abundance forecast of Klamath River fall salmon is 359,200 - well above last year’s predicted return, and the forecast of Sacramento River fall salmon is 229,400 below last year’s predicted return. 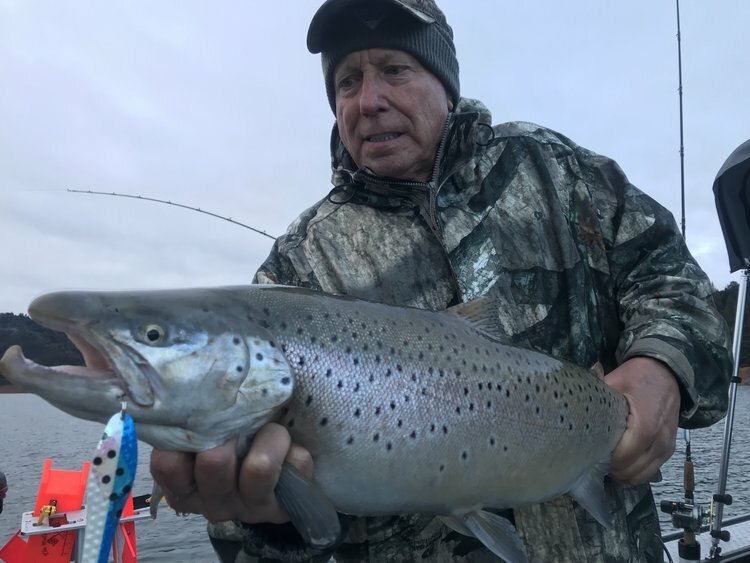 As usual, the In-River Sportsmen salmon fishing quota will be what is left over from the 50/50 split of Native Americans and Ocean Commercial, Ocean Sport fishing. I attribute the “Over Fishing” of Klamath Fall Chinook salmon to the Hoopa Tribe harvesting 10 times their allotment. The National Marine Fisheries Service sent a letter to the Hoopa Tribal Chairman asking why the Tribe harvested 1,660 salmon when their allotment was only 163 Fall Chinook salmon while all Ocean Commercial, Ocean Sport and In-River Sport fishing was curtailed. Many of you have asked about the new “Leader Length” Regulations. Well, here it is, as sent to me; This regulation was devised to try and stop or reduce the snagging, “flossing” fish from foul-hooking salmon. It shall be unlawful to use any configuration of fishing tackle in anadromous waters unless the distance between the terminal hook or terminal lure and any weight attached to the line or leader, whether fixed or sliding is less than six (6) feet. For purpose of this section, “weight” includes any product used to submerge the line or leader, including non-buoyant artificial flies or artificial lures, but does not include integrated or sinking fly fishing lines, lead core lines used while trolling from a boat, dropper weights used while trolling from a boat, or clipped weights used with a downrigger system. I hope this is not too confusing. I am trying to get an explanation of weighted flies i.e., bead head or bead body wet flies. Fishing: Fishing on the Upper Trinity is now blown out for the duration of this storm, but, then should go back to some good fishing. There is still some fresh steelies in the upper river, but it is getting more down runners than fresh fish. As for the Lower Trinity, the river is blown out at this time. It is the end of March and we should be seeing some seas run Browns, but I have yet to find any. I would expect that the high water is providing them a means to go up river without being detected. Fishing on the Trinity from the South Fork up to the dam is open all year long for trout and steelhead. The lower river is muddy right now, but could clear up soon if we don’t get much more rain. The good news is that the snow pack in the Trinity Alps is starting to pile up which will eventually melt and turn into water for the reservoirs and river. Mid-Klamath: Iron Gate Dam is releasing 1,872cfs. This is a significant increase to the water flows and will affect fishing for a while. 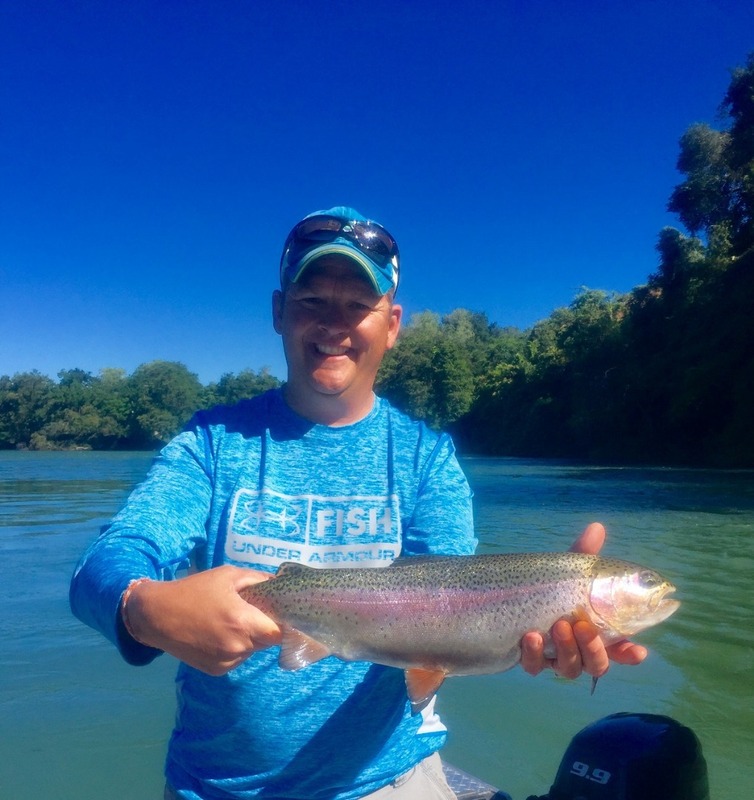 Most of the Klamath River is blown out at the present time, but hoping that the storms will turn into showers, thereby allowing some fishing in the near future. Lake Conditions: Whiskeytown is 85% of capacity (a decrease of 1%) with inflows of 424cfs and releasing 483cfs into Clear Creek and on to Keswick. Shasta is 79% (an increase of 4% and 5ft) with inflows of 10,789cfs and releasing 2,050cfs, Keswick is 85% of capacity (an increase of 0%) with inflows of 2,551cfs and releasing 3,094cfs; Oroville Lake is 46% capacity (an increase of 4% & plus 15ft), inflow is 8,458cfs and releases are 9790cfs; Folsom Lake is 64% of capacity plus 10% & plus 11ft.) inflows are 9,830cfs and releases are 1,995cfs. Trinity Lake: The lake is 42ft below the overflow (decrease of 1ft) and 75% of capacity (1% increase). Inflow to Trinity Lake is 2,186cfs and Trinity Dam is releasing 537cfs to Lewiston Lake with 4cfs going to Whiskeytown Lake and on to the Keswick Power Plant, and it is releasing 3,043cfs to the Sacramento River. Trinity River Flows and Conditions: Lewiston Dam releases are 305cfs with water temps of 47.6 and air is 46 degrees at 11:00am Sunday. Limekiln Gulch is 4.8ft at 372cfs, water temps of 43.8 degrees. Douglas City is 6.4ft at 487cfs, water temps of 44.6, air is 45. Junction City is 2.1ft at 576cfs. Helena is 9.6ft at 767cfs with water temps of 43.3. Cedar Flat is 5.2ft at 1,819cfs. Willow Creek is estimated at 4,126cfs air is 49 and water at 43.8. Hoopa is 17.1ft at 7,438cfs with water temps of 44.2. Flows at the mouth of the Trinity River at Klamath River are estimated to be 17.4cfs. Klamath: Iron Gate Dam releases are 1,872cfs. Seiad Valley is 4.3ft at 3,250cfs. Happy Camp is estimated at 3,812fs, Salmon River is 4.4ft at 2,443cfs, Somes Bar is estimated at 7,540cfs and Orleans is 7.7ft. at 9,983cfs and the Klamath River at Terwer Creek is 15.2ft at 25.6cfs, with water temperatures of 44.1 degrees. Flows at Smith River, Dr. Fine Bridge are 11.9ft at 8,510cfs. The low temperatures for Valley last week were 36/32 degrees and the high was 67 with 4.1in of rain with a season total of 53.1in of rain with 0in of snow in Willow Creek for a total of 4.15in of snow, but the mountains around us were all white with snow and the passes with chains required. Temperatures in the valley next week are expected to be 78/36 degrees with cloudy days for most of the week but showers are expected most of the following week.